Birthday cakes don't always need to be loaded with fat and calories. 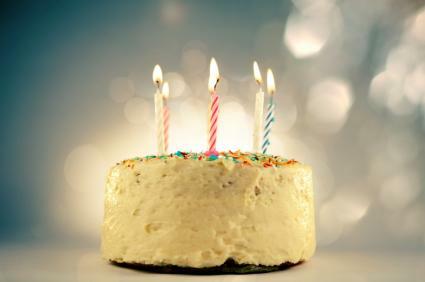 In fact, you can make a delicious birthday cake with fewer calories and less fat by using healthy ingredients. Try these tasty birthday cakes. According to Celiac Central, about one percent of the population have celiac disease, a condition in which ingestion can cause damage to the intestines. Many others may have non-celiac gluten sensitivity, in which ingesting gluten may cause an array of reactions. Likewise, milk and wheat are two of the most common food allergens. Because of this, a number of people are unable to eat traditional birthday cakes, which typically contain dairy and wheat products. The recipe makes about 10 slices of cake. This chocolate layer cake provides a delicious, gluten-free, dairy-free birthday cake with minimal sugar perfect for people with allergies or celiac disease. One unfrosted slice of this cake has about 240 calories. Nutritional data was calculated for this recipe and those following using the SELFNutritionData website and calculators. Preheat the oven to 350 degrees Fahrenheit. Grease and flour the bottom and sides of a seven-inch springform pan. In a large bowl, sift together the almond flour, coconut flour, baking soda, salt, cocoa powder, and sugar. In another large bowl, whisk together the coconut oil, eggs, vanilla, and maple syrup. Make a well in the dry ingredient mixture and carefully pour the wet ingredients into it. Fold the mixture together with a rubber spatula until it is combined. Do not overwork the mixture. You will still have a few streaks of flour in the finished product. Pour the batter into the prepared pan. Bake it for 40 to 45 minutes until a toothpick inserted in the center comes out clean. Allow the cake to cool for 10 minutes on a wire rack. Gently run the knife around the edge of the pan and then release the cake from the pan. Working crosswise with a sharp knife, cut the cake into two or three layers. Frost and fill with your favorite filling and frosting, such as sugar-free icing. Whole wheat flour is higher in fiber than the white flour typically used in birthday cakes, which gives it a nutritional edge. Likewise, most cake recipes contain at least a cup or more of sugar, so this is a relatively low-sugar recipe. You can frost it with a light meringue frosting to keep it light. This recipe serves about nine people. 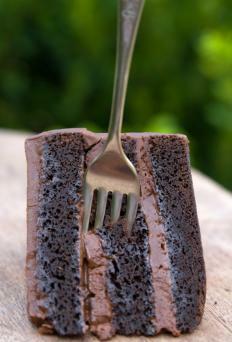 An unfrosted slice of cake has around 250 calories. In a large bowl with a hand mixer, or in the bowl of a stand mixer, beat together the butter and sugar until it is light and fluffy, about five minutes. With the mixer still running, add the eggs one at a time. Add the vanilla. Continue mixing until well combined. In a medium bowl, sift the whole wheat pastry flour and baking powder together. Add it to the batter and stir by hand until it is well combined. Stir in the milk and continue mixing by hand until you have a smooth batter. Pour the batter into the prepared baking pan and bake for 30 to 40 minutes until a toothpick inserted in the center comes out clean. Cool on a wire rack. Cool completely before frosting. Carrot cake sounds healthy all by itself. After all, it's a cake. It's made from carrots. 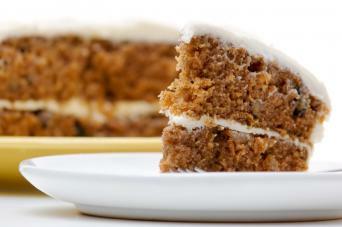 However, typical carrot cake recipes have oil in them for moisture, which raises the cake's fat content. This cake, on the other hand, uses applesauce in the batter in place of oil. Not only does the applesauce retain the cake's moisture without adding oil, but it also brings additional vitamin A, vitamin C, and fiber to the cake, which isn't bad for a dessert. This cake serves about 10 people. It has approximately 360 calories without frosting. With the applesauce in place of the oil, it has around eight grams of fat per serving as opposed to about 35 grams of fat per serving with the oil. Preheat the oven to 350 degrees Fahrenheit. Grease and flour two eight-inch round pans. In a large bowl, whisk the applesauce, sugar, eggs, and vanilla until well combined. In another large bowl, sift together the flour, baking soda, baking powder, salt, cinnamon, and nutmeg. Make a well in the dry ingredients and carefully pour in the applesauce mixture. Mix with a rubber spatula until the batter is just combined. Fold in the carrots, coconut, and pineapple until well combined. Bake in the preheated oven for 35 to 40 minutes until a toothpick inserted in the center of the cake comes out clean. Cool on wire racks until cakes are completely cooled. Run a knife around the edge of the cake in the pan and remove the cakes from the pan. Cake on a birthday is an important tradition for many people. That's why finding healthier cake recipes for people who are watching their diet can help make someone's birthday so much more special. It shows you care enough about their special day to make the effort to provide them with a delicious and healthy cake - and if you create a birthday design on top of the cake, you're sure to bring a smile to their faces!